Summary: Using evolution’s deception one can prove that God exists. We’ve all had these kinds of questions in our minds or have had someone ask us and not always had the answer! There’s a big difference between these 2 statements. How do we answer the question of the existence of God in order to influence society? This is what I will try to accomplish today! Think for a moment about the enormous affects of this issue: If God created, then that puts Him in authority, but if evolution is correct, that puts man in authority! Do you see what’s at stake? Key: What society believes of its origins directly affects it’s whole worldview! It is either a humanistic or theistic battle for today’s mindset! 21st Christians must know what they believe and why they believe it or Christianity is no good for anyone! In the last 40 years we’ve been playing catch up with secular society with regards to answers to the nagging questions we all have about life. 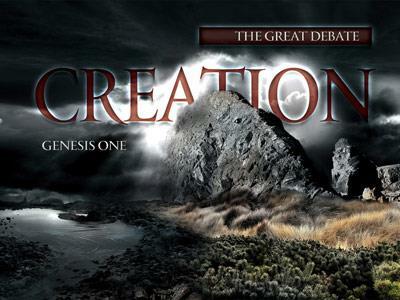 Think about this…for nearly 1900 years we held to Biblical creation. It has only been in the last 160 years that secular society has attacked the Biblical account of creation with vigor and viciousness! Men like Fredrick Nietzsche (“God is dead”), Benedict Spinoza, Sigmund Freud and David Hume, to name just a few, have made a serious wreck out of the faith of millions around the world. The major dents that make up this wreck: belief in God’s existence, reliability of the Bible and their denial of miracles. And yet every one of these men believes in evolution, and if true, is the greatest miracle of all! David Hume said, “A miracle is a violation of the laws of nature.” This is not true, a miracle is going beyond the laws of nature, example: healing cancer cells. Think of it this way…believing that a God beyond the universe, created it, controls it can also interfere in it. But using David Hume’s statement, evolution is a violation of the laws of nature in every way, which I will prove in the weeks ahead! Let me ask…how many would like to put me in a padded cell if I said that this worship center came into being by random chance? Or let me put it another way…how about the presidents on Mount Rushmore, what if I said that they were carved out of that mountain by millions of years of wind and water? That’s laughable! All of us would say that there is a recognizable intelligence behind its creation! What is he saying…not that God made anything, but that chance can go to this extreme! Think for a moment: if you could just take one of your living cells and take the information from it, the information would take up approximately 500,000 pages. What is DNA? Think of it as a long piece of rope with beads of molecules that are put on it and all of those molecules would spell out every minute aspect of who you are. It could be said that DNA is the Morris code to man’s existence! Okay, not to be rude to the sermon, i think its wonderful. but this is just to add a little twist, and cause people to think. but since you say that things cant just order themselves into something extraordinary, then where did God come from? That''s where your faith begins. Moses wrote (with God''s leading) Genesis and assumed that the "God Question" was not a problem, since he was speaking to Him. My question to you Ashley is this: Why is the sermon wonderful if there is this question of where God came from? Using evolution’s deception one can prove that God exists.